Real world impact guides the digital strategy of the Textile Museum of Canada (TMC), and our online initiatives not only provide access to rich cultural assets but incorporate innovation to enrich and build digital communities, anticipating social needs. 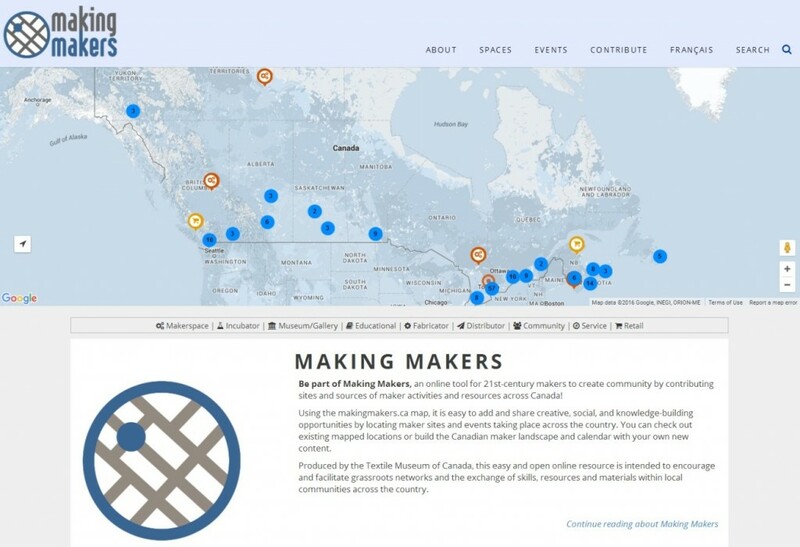 Launched in 2015, Making Makers is our most recent project, an interactive platform that allows Canada’s maker community to connect on national and local scales. 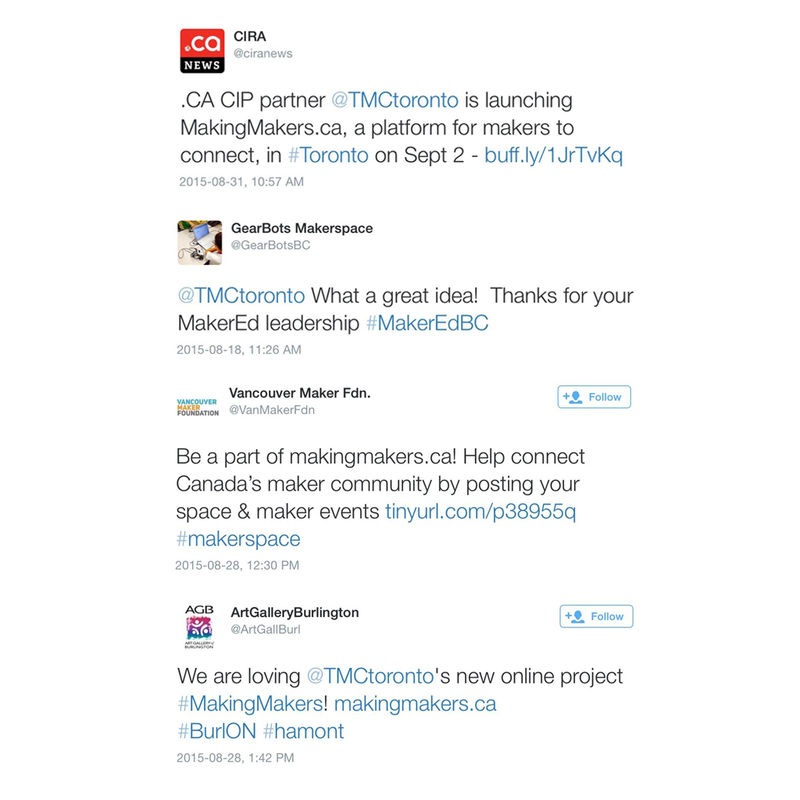 A collaborative digital resource, Making Makers empowers the Canadian maker community to connect and contribute their own maker activities, from weavers’ studios and knitting resources to spots for maker kids and 3D printing labs. Produced by the Textile Museum of Canada, the impulse of Making Makers was to leverage the Museum’s digital acumen as well as its core work with handmade practices, historical to contemporary, to create a tool to connect and document the diverse and dispersed contemporary maker landscape. By inviting makers to contribute spaces and activities to the site, Making Makers has been growing and evolving with Canada’s vibrant craft and DIY communities, significant 21st century audiences for museums today. Moving beyond exhibition-focused interfaces, the project exemplifies the TMC’s focus on extending our reach beyond institutional walls. By creating a virtual space that at once documents and maps Canada’s maker community, the project encourages and facilitates the development of grassroots networks and the exchange of skills, resources, materials, and ideas at local levels, uniting a national digital community. With nearly 200 submissions from across the country, Making Makers is an ever-growing catalogue of contemporary craft resources, community sites, galleries and museums, incubators, fabricators, distributors, educational resources, and services, offering an evolving map of Canada’s DIY landscape with icons representing all the participating makerspaces across the country. The site is free to use, open for anyone to contribute, and functions in both official languages, French and English. 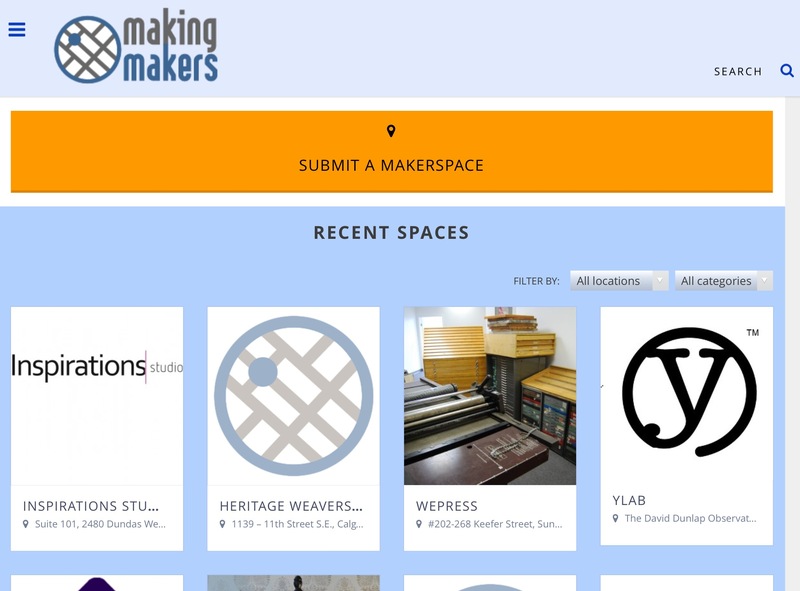 Makers use a simple submission form to share their location, contact details, social media presence and a personalized description of what they do at their makerspace. Users are able to provide as much or as little detail as they wish, connecting spaces from public organizations and schools, to individuals, labs, and incubators. Members of this digital maker community also can contribute their events and workshops which appear on a monthly calendar. A single day can feature a DIY workshop, a hacker lab, a knitting class, and kids code camp, capturing activity across urban and rural settings. Making Makers is vibrant and welcoming to all who identify as participants in Canada’s thriving maker community. The Making Makers interface is clear and simple to use. Users can view the whole country or focus on a specific province, region, or city. Results can also be filtered according to location or type of space. The newest additions are always featured on the homepage so regular visitors can see what’s been added since their last visit. 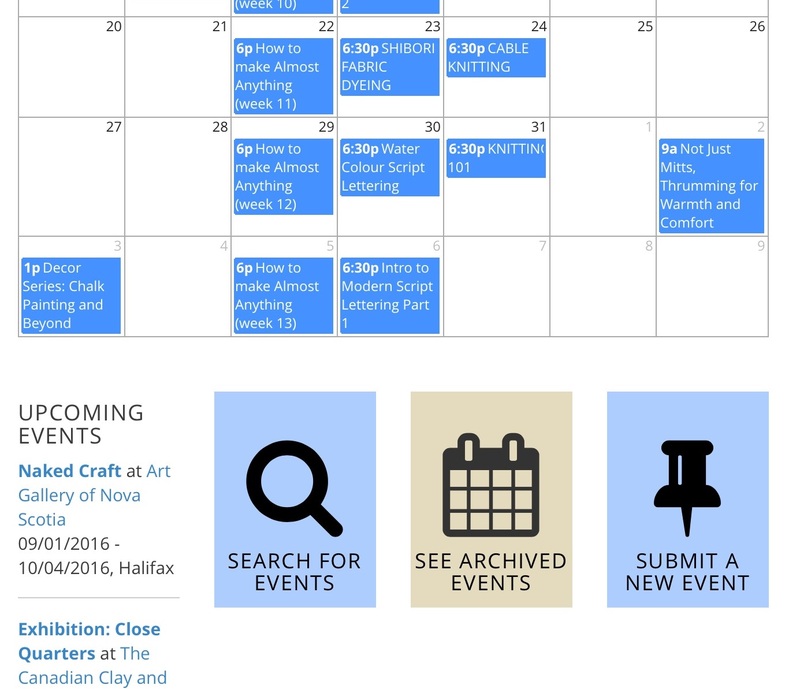 The calendar of events, meet ups, classes and fairs can be viewed by month, week or day and users can hover over or click on an event to get details. Providing a platform for greater awareness of the spectrum of maker activity is key for the TMC, and Making Makers offers a means to not only communicate, but expand knowledge and networks at local, regional and national levels. 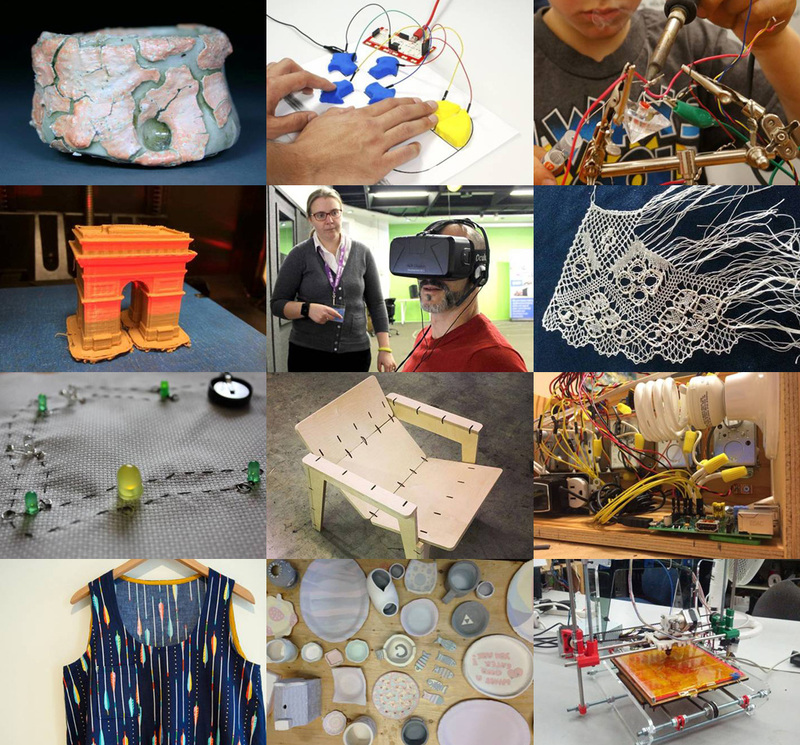 With a collection of over 13,000 artifacts and over 15 years of online investment, the TMC is equally “high touch” and “high tech,” uniquely positioning the Museum to connect craft, artisanal, DIY and digital dimensions of maker activities today. Taking audience development and community outreach to a new level, Making Makers is a strategic initiative in our digital development, building on the TMC’s work with over 2000 years of handmade practices to reach contemporary makers in their everyday lives, offering a digital tool to support and unite Canada’s disparate and dynamic maker landscape. Creating a virtual space that captures activity across urban and rural settings across the country, Making Makers activates the unique insight into the diversity of contemporary creative practice offered by the TMC, providing a vital platform to build this distinct social network and its values of innovation, sustainability and creativity while mapping its evolving landscape.